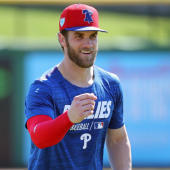 Zimmerman went 0-for-2 and played three innings at first base in his first Grapefruit League action Saturday, Jamal Collier of MLB.com reports. While the veteran did have a delayed beginning to his spring, the Nats don't plan to keep him out of game action entirely the way they did last March. "When things are good and my body is good, I'm going to play pretty regularly," Zimmerman said after Saturday's game. "If something comes up and my body doesn't feel good, then I'm not going to play." Manager Dave Martinez is on the same page. "The biggest thing is to keep him healthy throughout spring training," Martinez said. "Get his at-bats, but get him in the games. I told him, I want to see him playing more so that he can move his feet, play defense and run around the bases and things of that nature. But he felt good." Zimmerman has played more than 115 games only once in the last five seasons, so expecting a full workload from him in 2019 is foolhardy, but with Matt Adams back to give him plenty of rest, the 34-year-old at least could be healthier and more productive when he is in the lineup.